I got a coffee machine for Christmas and now I can make espresso, cappuccino & best of all, frothy hot chocolate, to my heart's content!! So I was especially pleased to see that a few card challenges this week used this theme as the inspiration to make a card, the colours of hot chocolate are just yummy, marshmallow, cream & brown, it's making me want one just typing about it!! This card, apart from the sentiment, uses stamps from the 2009 winter magnolia collection & I think it looks a little bare however this is deliberate because as soon as there's a big 'O' birthday to celebrate I'm going to whack it straight on the heart in great big glittery numbers!! Lol!! Woooow....this card is sooo amazing. I love it. Great work. wow love it!!! Seeing all your lovely tilda cards has got me going on them lol. How do you do the hair, have you used on the those blender pens? I need a colouring in lesson! Stunning card. 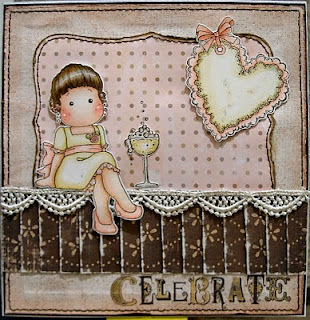 Love the image and the lace give it a vintage feel. Thanks for joining us at Charisma Cardz. Lovely blog Nikki! I just adore the pink and brown color combo. The lace is a perfect touch to a sweet card. I'll definitely return for more inspiration! Nikki this is utterly divine! Such a beautiful card! Your image is so sweet and your detail gorgeous! Thanks for your sweet words you are so kind! You can buy the accessory stamps on the Magnolia online store sweetie. Hi Nikki!!! This is just adorable!!!! Love the colors and your version of the pleating!! It really is a nice touch and I think you may have convinced me to try it out!! This is just beautiful!! Ohhh such a pretty card! Love the color combo, and the lace is just beautiful! What a gorgeous card. I love your image and your colour choice is lovely. Great pleating - so glad you could join us on JM this week! Thanks for joining us at QC.